Lincolnshire Emergency Blood Bikes Service (LEBBS) is a newly formed Charitable and ‘voluntary’ organisation who plan to create a free out-of-hours emergency service to hospitals and other NHS locations transporting blood, drugs, other medical items and even breast milk for premature babies from where it is held to where it is needed. In the short time that they have been formed, they have already attracted a great deal of interest and have "recruited nearly 200 expressions of interest" to provide the ‘voluntary’ service from community members across Lincolnshire. 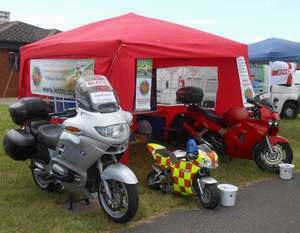 If you have been to some of the Lincolnshire events you may have noticed the LEBBS stand such as recently when they attended the Lincolnshire County Show to promote the charity and also to continue their fund raising efforts. Secretary - Tim Oliver, Deputy Membership Manager - Lee Fazal, as well as John Ferguson manned the Lincolnshire Show stand informing the crowds of LEBBS and its plans. With two full-size motorcycles and a midi-moto liveried in the Blood Bike colours, children and adults alike were drawn in to ask questions. 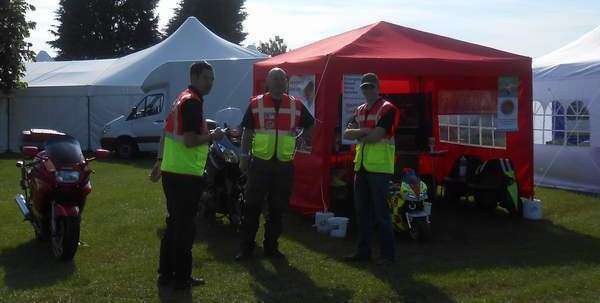 Their stand was also at the RAF Waddington International air Show this year, so if you are at any of these Lincolnshire events, look out for these guys. They have already begun to raise awareness in this vital area and have recently received, through HMRC, the charitable registration status. In order to provide a professional and reliable service to health care services in Lincolnshire, they have assessed that they will need to operate a fleet (at least 3 minimum) of suitably prepared and adapted motorcycles and a four-wheeled drive option for the winter months. They would like to discuss their goals and aims with any interested party and would be happy to visit to discuss any involvement further if anyone in the area is interested.